Construction sites can be very busy and chaotic environments. It is important that everyone who is on the site be aware of what is going on and how to safely navigate the area. Construction signs play an important role in achieving these goals. A variety of signs can be used for construction sites. Some construction signs may designate areas in which safety precautions must be taken. Construction signs may also indicate restricted access areas. In the case of businesses that will remain operational during construction, directional signs may be necessary for helping patrons find alternative routes and parking access. Construction sites are exciting places, indicating growth and development. 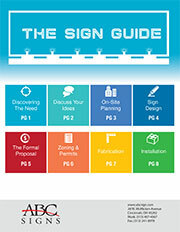 Construction companies may develop signage to showcase how the completed project will look. Construction signs also provide the opportunity for construction contractors and specialists to advertise services. Whatever your construction signs needs are, we can help. Contact us to discuss your signage needs!